It’s been 8 weeks since we last reported on short sales, and we’re happy to report short sale activity is up as we’d hoped it would be. Short sales make much more sense to all involved over a foreclosure as it helps preserve the sellers credit better, minimizes losses to the lender, and keeps the neighborhood in better condition. I recently heard a funny quote “Why do they call it a short sale if it takes so long?” While I can’t remember who said it, it’s funny because it’s so sad. Hopefully with new initiatives in place we’ll see quicker turn-around times for short sales. As a CDPE (Certified Distressed Property Expert) we thought we’d share a few tips to help agents navigate this short sale process and make your deals quicker and smoother. There is a clause in the Short Sale Addendum to Purchase and Sale Contract entitled #5; Multiple Offers which reads “Unless otherwise agreed by Buyer and Seller in writing, Seller may continue to market the Property for sale and accept other offers and submit those accepted offers to the lender.” We are not attorneys and we are not giving legal advice. This clause seems suspect though and we encourage listing and selling agents to amend or supersede this clause. A purchase and sale contract is between one buyer and one seller, and once accepted you can request the lender to take less than what is owed via a short sale. In a normal transaction a seller wouldn’t enter into multiple contracts with multiple buyers, so why would you muddy the waters and try that on a short sale? Selling the property to multiple people just seems unethical and one buyer may have legal remedies against a seller for employing such a tactic. Quite often we see sellers accepting any offer that comes down the road, but the lender certainly would not agree to the short sale because it is so far below market value. The lender wants to minimize their loss, and only agree to short sales if it makes sense. Sellers would be far better off negotiating or waiting for a reasonable offer than to accept any old offer. When you submit multiple contracts to a lender they mistakenly think it must be a hot property and hold out for more, and many times each new offer starts the process all over again, further delaying approvals. And keep in mind when you submit more than one contract, the seller may be legally liable to more than one buyer. You don’t submit offers to the lender, only accepted contracts. A seller should really only enter into one accepted contract. A lender cannot do anything without an accepted contract between buyer and seller as the lender is not a party to the transaction and can’t sell to anybody. This could change if they foreclose, but until then they are just the lender. If you’re a buyer the last thing you want is the seller sending in other accepted contracts. It would be far better to move on and go buy another home and not waste any time waiting or investing in inspections, etc. As a seller, it should also be the last thing you want as well as it can hold-up or kill your sale. From a practical standpoint we don’t even know why this clause is in the addendum, or why agents or sellers would employ this tactic. The other advice we would give is to have the sellers completely fill out a financial questionnaire upfront before taking the listing. There is no sense wasting buyers and sellers time if the seller isn’t going to qualify for hardship with their lender. You’ll need all this information with the accepted contract anyway, so it’s best to do it upfront and save everybody time. Not only will this speed up your short sale, but it will also help you skip doing deals that should never be attempted in the first place. Buyers are skittish enough on short sales anyway, so why attempt one if it has no shot at success? We’ll bring you more tips on short sales in upcoming articles. By educating the market on what works and what doesn’t, everybody wins. Good luck buying and selling. We’re all in this market together, for better or worse, and it pays to work together for success. We just posted two new videos of our Future of Real Estate show. The first segment, Pricing Your Home to Sell – Future of Real Estate demonstrates the Pricing target, which shows homeowners how well their property is priced depending on the number of showings, drive-up, and drive-bys. This graph is very informative and has been tested across North America with many Star Power Stars and attendees, which are the highest producing agents in the country. Brett, Mike, and Sande of the Ellis Team are Star Power Stars and and enjoy learning and sharing great ideas with other high powered agents. The second video Featured Hot Listings – Future of Real Estate SW Florida features four new listings, one in Daniel’s Park which is a gated community in South Fourt Myers for $165,000, and other in Brandywine in Myerlee for $20,000, one in Carillon Woods and another in the Forest Country Club. We also tell you how to view virtual tours of all the Ellis Team Listings, as well as search the entire MLS for free. Future of Real Estate SW Florida New Videos. A few weeks ago we wrote about attending a recent bank foreclosure and short sale conference. We told you that banks and the US Treasury department have learned that home retention and loan modifications are not working, and that 2010 will be a year of “The Transaction” either by short sale or foreclosure. More banks are actually pursuing both simultaneously. 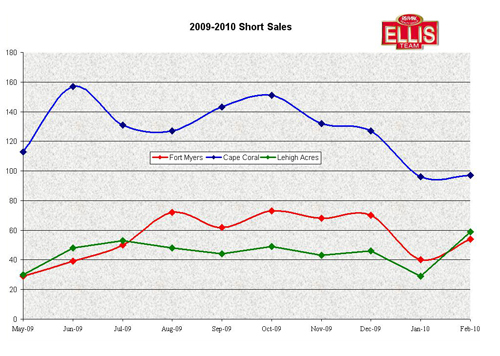 We’ve been illustrating graphs showing the percent of distressed sale activity in Fort Myers, Cape Coral, and Lehigh Acres for months now, and this week we decided to update Short Sale activity. While analyzing MLS data this week we noticed foreclosure sales have dropped in January and February to about 579 per month, down from approximately 700 or so the previous 5 months. This can be attributed to a backlog of foreclosures in process and a moratorium in place early in 2009. 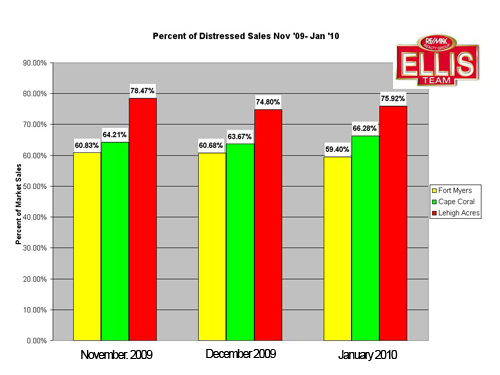 We also noticed a stabilization and recent up tick in short sales, reversing a decline in December 2009. Will these trends continue? Let’s start with the foreclosures. 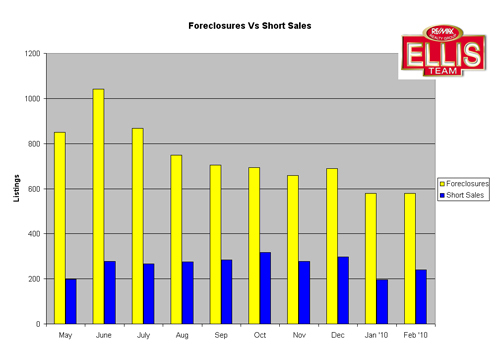 We believe foreclosure sales will increase in 2010 as the backlog comes to the market. In fact, we’ve received a large volume of foreclosure listings we’re working to bring to market. It typically takes time to secure the property, assess the condition, the value, workup a Broker Price Opinion, compare that against the bank’s new appraisal, and meet with the investor to develop a marketing strategy on each property. All of this is done through the use of a bank asset manager, either an employee of the bank or 3rd part asset manager. Either way, asset managers specialize in disposing of REO (Real Estate Owned) bank foreclosures. Once the value and strategy is determined, the property goes from a pre-listing to an actual listing complete with instructions. The agent then lists the property in MLS and solicits offers. Many times the property elicits multiple offers, and the agent presents all offers that match the bank’s criteria. For instance, we are not allowed to present any offers where we have not personally verified cash funds to close on all cash deals, nor are we allowed to present any subject to financing offers without pre-qualification from that bank’s in-house loan officers. Banks do not want to take properties off the market simply because a buyer presents a pre-qualification letter from an unknown or out of town bank or mortgage broker. Speaking from experience, banks and agents have had bad experience with pre-qualification letters. They are easy to get, and are rarely worth the paper they’re written on, so it is quite natural the bank wants their own people to look at the qualifications of the buyer if they are getting a mortgage. The borrower doesn’t have to use that bank, but the bank will not look at the offer unless they are offered their pre-qualification letter with the offer. So we know 2010 will offer more foreclosure properties that have been initiated in 2009. What about short sales? Banks are not offering loan modifications as much as they have proven that they do not work long term. Politicians still promote the idea as it sounds politically correct, but it further exacerbates the problem. We are seeing large banks making a push to go online. Bank of America for example now negotiates their short sales online through a system called Equator. We have been using Equator to handle Bank of America foreclosures for years. We hear that banks such as Wells Fargo and perhaps others are in the process of adding their short sales to Equator. This online venue will allow greater efficiency and allow more people to touch the file, reducing the time it takes to approve a short sale. The short sale is still a complex transaction and homeowners should not attempt it alone. In fact, your bank will refer you to use an agent who is familiar with the process. Short sales are not for every agent and should only be tackled by agents who are committed to learning and operating in a very rigid and complex process. Buyer agents regularly interview listing agents to make sure the listing agent knows what they’re doing, because if they don’t, the process will fail. 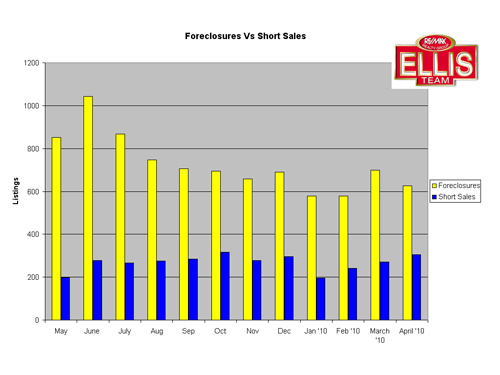 Look for 2010 to see rising foreclosure sales throughout the year, and perhaps rising short sale numbers as well. The banks are committing resources to it. We’ll keep reporting the numbers we track, so check back often. Printed in the News Press, News Press Online, and Ellis Team Blog. 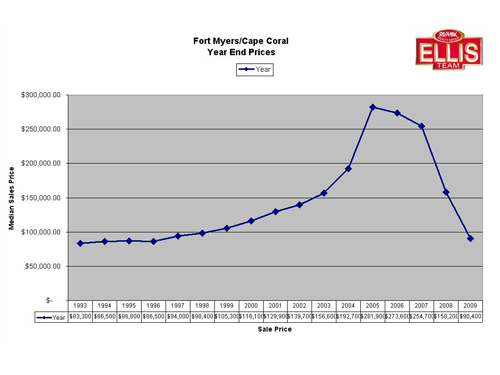 Posted in Cape Coral, Fort Myers, Lehigh Acres, Southwest Florida Real Estate. This is the time of year agents are busy selling properties. 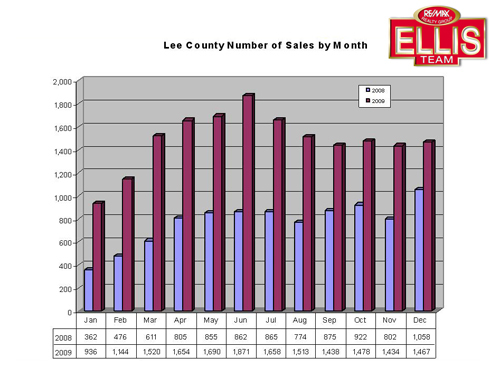 If you look at the last two years, historically you will see that sales begin to build each month heading into summer. The last two years are fairly typical as to how our local market works. April and May closed sales are results of deals put together in March. There is typically about a one month lag from contract to closing. Some closings occur in the same month, and some take longer, especially short sales. We think everyone who possibly can buy is attempting to right now for several reasons. Interest rates are headed higher. The Treasury Department’s phase-out of buying mortgage backed securities on FNMA and Freddie Mac expires this month. The last time this happened rates shot up about ¾% in a week or so, so we’re keeping our eye on rates in April and what if anything the government does when they shoot back up. We also have the Home Buyer tax credit in place for sales through April 30. Buyers have a few months after that to actually close these sales, but essentially it allows first time home buyers a credit of up to $8,000 and repeat home buyers a credit up to $6,500. This is real money, and buyers are acting to receive this money. 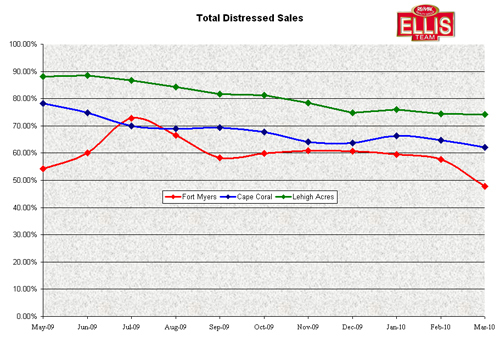 Additionally, inventory in certain price ranges is drying up, and prices are low. Buyers from near and far and reaching to scoop up these bargains. Because these homes are so far below replacement cost, these prices won’t last once the economy improves and builders start building again. Many of these homes are 40-50% below cost, so there’s a built-in profit for buyers willing to buy now and hold until market improves. We know why the market is Hot, but let’s go behind the scenes and explain some things that are affecting the market many people might not know about. The first major obstacle is appraisals. Appraisals have been coming up short up to 30% of the time as appraisers not familiar with the neighborhoods are using comparables that are not the best for the subject property. They are not taking the time to discern if the two neighborhoods are similar, or if the comparables condition is similar. We’ve seen appraisers use comparables from other neighborhoods that just don’t measure up while ignoring a good comp 2 doors down that closed last week. We’ve also seen appraisers only use the foreclosures, but they don’t tell the whole picture. The foreclosures can need lots of work and be in poor condition, and if the appraiser wants to use them as a comp, they need to research its actual condition when property sold. The next big issue is we often have multiple offers on each property, and buyers are bidding against each other. Cash is king, and buyers wishing to finance have a hard time competing with cash buyers. The seller doesn’t have to worry whether the buyer will get financing when a cash buyer is involved, nor worry about a bad appraisal. Many of these properties are selling well over asking price, and many buyers are frustrated no matter what they do they can’t land a property. We also have out of town buyers who believe they can bargain down these homes, and wonder why they lose home after home when the sellers accept someone else’s offer. Many buyers have said they don’t pay full sticker price, and yet they’re downright frustrated when the seller accepts another buyer’s offer. Agents I speak with say they are educating buyers right upfront about our market, but buyers often times have to try for themselves. A buyer can find out the hard way and miss out on their first 6 choices or take their agent’s advice and have a chance at getting choices 1-3. Even if you offer $10,000 over asking price all cash, there’s no guarantee you’ll get the home, but at least your chances are better. It pays to study each submarket and determine how each home fits in that puzzle. Lastly, title can be an issue. If you’re buying a foreclosed home, it’s not uncommon for a title issue to creep up and extend the closing out. Banks don’t always complete the full title process until a contract is secured, and that’s when it could be discovered some outstanding liens, or homeowner associations trying to collect more than the law allows to issue an estoppel letter. We’ve even experienced a home that needed to be re-foreclosed as it wasn’t done properly the first time. If our market wasn’t so challenging, we’d see even higher sales reported. This market is more complex than ever, but at least it keeps people on their toes and moving. That’s often little solace to those caught up in a deal when things are going wrong, but I guess it beats having a dead market. There’s nothing dead about the SW Florida real estate market. What Are Buyers Looking For Today? We’ve been compiling our annual State of the Market Report which will be released soon and this year more than any other some interesting trends are developing. Full time agents tend to get caught up in the deals they’re working on and could miss some of the major trends developing in the overall market. 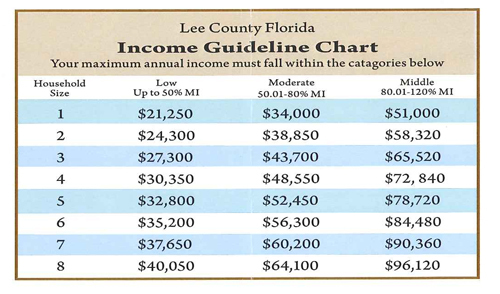 It is always so interesting to analyze the overall Lee County real estate market, and then dissect down to the smaller sub-markets and see what story the data conveys. This past week I asked several full time agents who work with a lot of buyers if they could tell me what they’re seeing on a day to day basis. I then compared what they said with the data we’re compiling to see what they story is. A few themes developed from their stories. The first theme is many buyers have heard Florida is on sale, so they come down here with unrealistic expectations about what they can buy. Agents are receiving unrealistic requests for things like gulf front homes or condominiums 1 block from the beach with a garage, built in the 2000’s for $100,000 or less, or waterfront gulf access homes, 3 bedrooms, 2 baths, built in the 2000’s for $150,000 or less. The stories go on and on. Many buyers want to look at bank foreclosures, but they don’t want to do any work if it needs repair. They expect all homes should sell at the bank foreclosure prices regardless of whether they need work or not. Many buyers feel the foreclosures set the prices in the neighborhood even though they may be missing a kitchen and needs tens of thousands in work. Buyers are quite often dissatisfied with the condition of the distressed properties, but they don’t want to look at a regular home that is all fixed up because it is not a perceived bargain. You could take two identical homes next door to each other, one being a foreclosure and needing $15,000 in repairs and another being a normal sale and in excellent condition. The bank foreclosure might be priced $15,000 below the normal home, but when the buyer sees it they’re turned off. They’re also turned off by the price of the normal home because they feel it should be priced $15,000 lower. Many times there is a reason a foreclosure is less money. It takes money to fix them up, not to mention time and effort. Not everybody wants to do that. Another theme is buyers have no idea homes are selling as quickly as they are. Many buyers are looking around and because there is some inventory believe they have time. Many are not motivated to pull the trigger because they believe that home, or one just like it will be on the market in 6 months or next year. Buyers do not believe these homes are receiving multiple offers and being scooped up by investors who can actually cash flow them at these low prices. The emotional buyers are seeing fault with the homes and are afraid to buy. The studious investor is beating the regular buyers to the punch because they know these homes will be selling for more in the future, and they can actually rent them out and make more return on their money than other investment vehicles. These homes make financial sense to investors on both ends of the spectrum. The regular buyer is operating out of fear and lack of knowledge about the local market. After they miss out on several properties to higher bidders it becomes apparent to them this market is much more active than they actually thought. 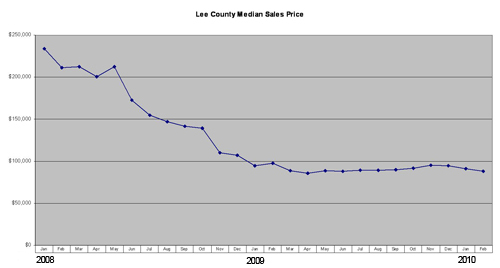 The SW Florida real estate market is on sale, but it’s the old herd mentality buyers follow. Buyers tend to be most motivated when everyone else is buying, usually at the height of the market. It’s true in the stock market, and real estate market. 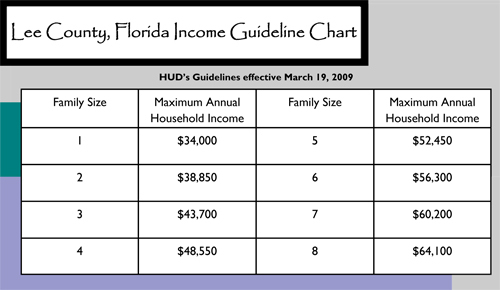 Back in 2004 and 2005 people couldn’t buy fast enough, sometimes buying groups of homes. Would you say buying a home back in 2005 was a better investment than buying one in 2010? And yet the motivations were higher back in 2005 because people weren’t afraid, when they should have been. 2010 is a far greater opportunity, and the people who study the market realize it. Later this week we hope to release our State of the Market Report at www.Topagent.com so you can analyze what properties are selling the best right now, analyze where the inventory is, and what prices are doing on a monthly basis. Being informed will help you make a better buying or selling decision. It makes no sense to miss out on opportunities because of lack of local market knowledge just as it makes little sense to overpay, or list at the wrong price either. If you list too high your property won’t sell, and if you list too low you’ll be giving equity away to someone else who is more informed than you.